i3 Insights: Heuristics are Biased. But are They Lazy and Dumb? Behavioural economists believe that humans make irrational decisions. They point out that we use mental shortcuts and often rely on simple rules of thumb (known as heuristics) which lead to sub-optimal decisions. Heuristics are biased. This is because they deliberately ignore a lot of information. They usually focus on a small number of salient features (often only one), rather than consider every relevant variable. It seems reasonable to believe that making quick decisions without considering all of the relevant information will get us into trouble. But what if it’s impossible to consider it all without making a lot of mistakes? In that case, heuristics may not be such a bad idea. My last post introduced Gerd Gigerenzer, a psychology professor at the Max Plank Institute and one of the more vocal critics of behavioural economics. Gigerenzer makes a convincing argument that heuristics work better (greater accuracy and faster decision-making) when decisions involve a high-degree of uncertainty. One of the examples that Gigerenzer frequently cites is the 1/N diversification heuristic. When faced with a set of N investment choices, most people will simply divide their money equally across each investment option. In other words, they allocate 1/N to each investment choice. This simple heuristic is clearly biased as it focuses only on a single piece of information (i.e. the number of investment choices). It ignores everything else. But is it dumb? Jason Zweig recounts the following story in his book Your Money and Your Brain. In the 1950s, a young researcher at the RAND Corporation was pondering how much of his retirement fund to allocate to stocks and how much to bonds. An expert in linear programming, he knew that “I should have computed the historical co-variances of the asset classes and drawn an efficient frontier. Instead, I visualised my grief if the stock market went way up and I wasn’t in it – or if it went way down and I was completely in it. My intention was to minimise my future regret. So I split my contributions 50/50 between bonds and equities.” The researcher’s name was Harry M. Markowitz. Several years earlier, he had written an article called “Portfolio Selection” for the Journal of Finance showing exactly how to calculate the trade-off between risk and return. In 1990, Markowitz shared the Nobel prize in economics, largely for the mathematical breakthrough that he had been incapable of applying to his own portfolio. Does this mean Markowitz is a hypocrite? No. Markowitz understood better than most that correctly estimating the future variance and covariance of an asset class is difficult. No doubt he also understood that it would require either making forecasts or analysing a lot of historical data. How good is this rule of thumb? In a study, it was compared to mean variance and a dozen other complex investment methods… The mean-variance portfolio made use of ten years of stock data, while 1/N did not need any. What was the result? In six of seven tests, 1/N scored better than mean variance in common performance criteria. Moreover, none of the other twelve complex methods was consistently better at predicting the future value of the stocks. Gigerenzer explains why more complex decision-making strategies such as mean variance optimisation (MVO) underperform the 1/N heuristic. To use such a complex formula requires us to estimate a large number of parameters based on past data. Yet as we have seen, ten years is too short a time to get reliable estimates. Say you invested in 50 funds. How many years of stock data would be needed before the mean variance method finally does better than 1/N? A computer simulation provides the answer: About 500 years! Keep this in mind the next time an asset consultant advises you to allocate A% of your portfolio to fund manager X and B% of your portfolio to fund manager Y.
Gigerenzer’s key point is that there’s a trade-off between bias and complexity. Adding more information reduces bias, but it adds complexity and with it the potential for estimation error. This is referred to as the bias-variance trade-off. Nassim Nicholas Taleb provides a great illustration of this in his new book Skin in the Game. Here’s an example that’s inspired by Taleb. Suppose that two archers, Sally and Robert, each fire ten arrows at a target. Sally’s shooting is consistent (i.e. low variance) as all of the arrows are grouped close together. 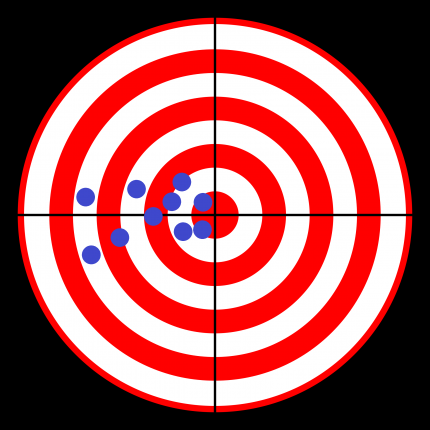 Notice that there are no arrows on the right side of the target. Sally’s shooting shows low-variance and a high-level of bias. Her aim is clearly biased to the left-of-centre. This is because Sally is aiming for the bullseye, but she ignores a strong Westerly breeze. Robert’s shooting is inconsistent (i.e. high variance). His arrows are evenly distributed all over the target. There are five arrows in the top, bottom, left and right halves. His shooting shows high-variance and a low-level of bias. Robert’s aim is clearly unbiased. That’s because he’s trying to adjust his aim to compensate for the Westerly breeze. The difficulty is that the strength of the breeze is not constant. It comes in gusts and bursts. Sally represents a simple heuristic while Robert represents a more complex model. Heuristics are biased because they ignore A LOT of information. The 1/N rule only considers the number of investments to choose from. It ignores everything else. This bias reduces variance. A complex model reduces bias by considering more information. But this also creates the need to estimate parameters for each variable. A small error in each parameter quickly magnifies itself into a high level of variance. Consequently, a reduction in bias may significantly increase variance. This explains why many quantitative strategies use equally weighted portfolios. If anyone could figure out a complex allocation strategy that works, it’s the quants. Yet many stick to the 1/N heuristic. The lesson is that it’s not always correct to conclude that simple rules of thumb are irrational, lazy or dumb. But this is what behavioural economists do. Heuristics recognise that the future is uncertain. They deliberately give up on trying to find an optimal solution and instead focus on trying to find a reasonable, common-sense alternative. Turns out that they aren’t really losing much as the optimal solution is effectively unknowable. Gigerenzer suggests that decision-makers use a framework to decide when to rely on heuristics and when to use a complicated model. This is something that we’ll consider in a future post. But first we’ll consider another concept promoted by behavioural economics – system one vs. system two thinking.